The National Labor Relations Board’s general counsel named McDonald’s Corporation a “joint-employer” in 13 legal complaints against the franchise Friday, marking another victory for the efforts of unions to organize fast-food workers. The decision was not a surprise, as Richard Griffin, the general counsel of the NLRB, had given the same opinion in July, when he decided to investigate the claims of a series of lawsuits against the fast-food chain for allegedly harassing employees for engaging in union-related activities. The complaints will be brought before an administrative law judge beginning in March 30 of next year, and hearings will be held in the agency’s regional offices around the country before and after initial litigation. The judge’s ruling can be appealed to the five-member NLRB and a federal appellate court. The case could be resolved with a settlement, although McDonald’s Corp. said that it and its franchise operators will contest the unfair labor practice charges. “These allegations are driven in large part by a two-year, union-financed campaign that has targeted the McDonald’s brand and impacted McDonald’s restaurants,” McDonald’s said in a statement. The complaints are a culmination of almost 300 charges brought against McDonald’s and its individual franchisees since November 2012, and may be a step toward the unionization of fast-food workers countrywide. Historically, fast-food workers have found it difficult to unionize because of their high turnover rates and the franchise structure of fast-food chains. The employers of fast-food workers are mostly small- to medium-sized franchise operators, and McDonald’s said it directly operates less than 20 percent of its restaurants worldwide. 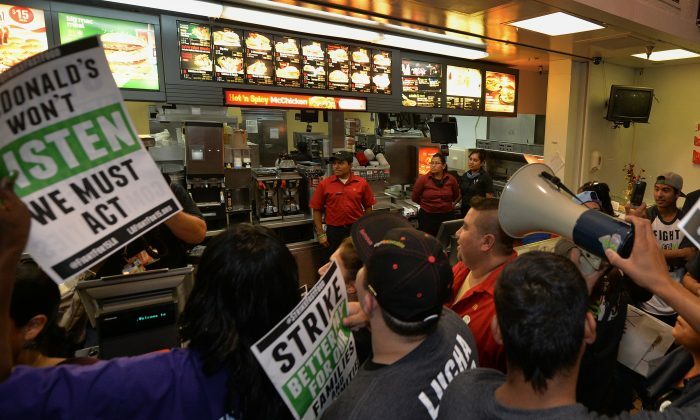 However, a nascent fast-food labor movement has swept across the country. Fast-food strikes were virtually unheard of a decade ago, but on Dec. 4 thousands of fast-food workers staged a strike in over 190 cities to protest for a $15 minimum wage. The complaints issued Friday only concern the liability of McDonald’s Corp. for alleged retaliatory action against workers involved in union-related activity, and not its responsibility for the wage and hours of employees at individual franchisees. The complaints argue that the indirect control that McDonald’s Corp. has over franchisees “beyond protection of the brand” makes it liable for the alleged retaliation. The McDonald’s suits relate to the broader, politically charged conflict of to what extent large companies are liable for the actions of franchisees and subcontractors, a dispute mapped along political lines. The current members of the NLRB were all appointed by President Obama, and have made consistently pro-labor decisions during the tenure. In June, the Supreme Court invalidated scores of NLRB decisions after it found unconstitutional the president’s 2013 appointment of three NLRB members during the Senate recess to avoid a Republican filibuster. Republicans, who took back the Senate in November, have already laid out a plan to reform the NLRB, and with a rhetorical mandate from the electorate, have already made the president retreat on the NLRB during the lame-duck session. Obama was expected to nominate Sharon Block to replace Nancy Schiffer, whose term on the NLRB expired on Dec. 16, but instead put forward Lauren McFerran, who is seen as more moderate than Block, after objections from Senate Republicans, according to Politico. “The board is too partisan, swinging from one side to the other with each new administration—taking employers and employees on a wild ride,” said Alexander, who is the incoming chair of the labor committee. McDonald’s customer service: An executive with McDonald’s said recently that customer service at its locations is “broke,” according to The Wall Street Journal. Labor unions and low-wage workers have been pushing for a $15 an hour minimum wage for the last two years, with success in San Francisco and Seattle.